Today's guest post is from the lovely Marie-Luise of Lauriestrodes Fun With Nails. Her post features the very thing I want to improve at - how cool is that! Hi there, all you amazing Crumpeteers!! My name is Marie-Luise and I have my own little corner here in Nail Blog Land called Lauriestrodes Fun with Nails. First of all I would like to say a thousand thanks to Debbie for inviting me to guest blog - it is such an honour to be here. Hopefully you like what you see. Today I'd like to share my go-to mani. I do these on a very regular basis since it gets me through my enormous stash of untrieds and I can combine straight polish with nail art. I give you: The Skittlette. 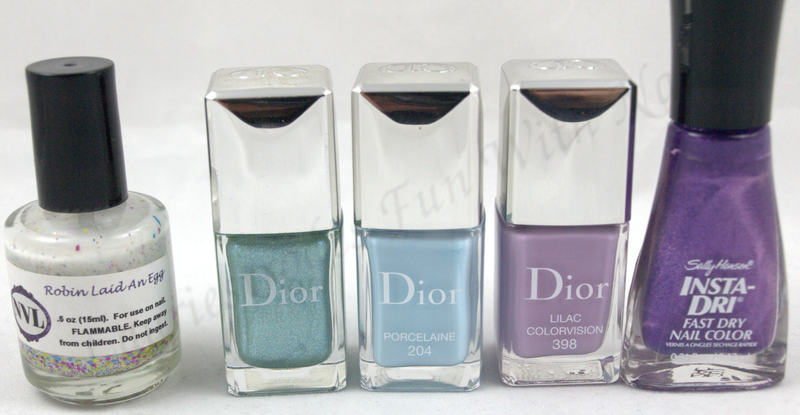 I have a huge thing with Dior nail polishes, I am sure they will be my downfall at some point. And when I saw the Trianon collection in January I knew I'd have to have Porcelaine since I am a sucker for pastel blues. I immediately decided I'd do a gradient with my Dior Lilac Colorvision, and since this all coincided with Debbie's invitation to guest blog I thought it would be perfect for this. When I finished the gradient I thought it could do with some stamping. I really enjoy the MoYou London plates so I chose one of the patterns from the Pro 04 plate and stamped with Sally Hansen Instadri Orchid Express. My ring finger is also Porcelaine but here it is topped with Dior Peppermint. I got the idea when I saw Dior Perlé (also from the Trianon collection), since it looked like it was Peppermints pink cousin. Perlé dries matte though. The lovely white glitter polish is NVL Robin Laid an Egg, one of my newest treasures. A VERY good nail friend parted with it and I am so thankful - I absolutely adore it! My Go-To top coat for nail art at the moment is Dior Gel Coat. Yeah I know, it is crazy expensive but it doesn't drag my designs, it wears like iron (trust me, I open film cans on a daily basis and that kills most nail polish if the top coat isn't all that and more) and the shine is phenomenal. Hopefully you stayed to the end of this and enjoyed reading it as much as I enjoyed coming up with and making this fun and springy mani. And once again Ms. Crumpet: thank you so very much for the spot here.